Should Emery re-offer him a new deal? Unai Emery hailed the ‘qualities and experience’ of Aaron Ramsey following his performance against Spurs yesterday, despite the midfielder set to leave the Emirates. The 27-year-old came on in the beginning of the second-half in the north London derby and helped inspire the Gunners to a 4-2 win over their fierce rivals. Ramsey and fellow substitute Alexandre played pivotal roles in Arsenal’s comeback when they were 2-1 down at the break, with the former setting up two goals. “I was thinking first about the first XI, then I was looking at the decisions, choosing the first XI with different possibilities. “Aaron has chances to help us, either by starting the match or when the match is in the second half to play minutes. “Above all today can be his day. Because it’s against Tottenham and he has experience of matches like today. However, the Welshman’s contract is set to expire at the end of the season and could even leave Arsenal in January for a cut-price deal, with several top European sides, including Juventus and Real Madrid, reportedly interested. Ramsey has been in and out of the first-team so far this season, starting 10 of his 19 appearances in all competitions, and has scored one goal and set-up a further six, these all coming in the Premier League. 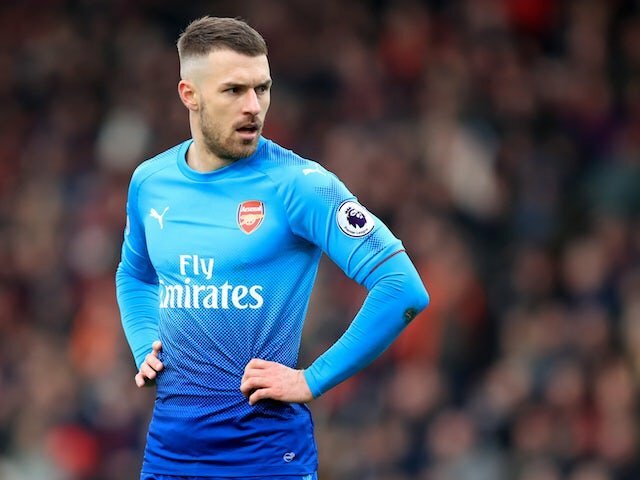 Ramsey was offered a contract extension near the beginning of the season, but this was reportedly withdrawn from the club due to the player’s demands. However, following Emery’s latest admission on Ramsey, combined with the midfielder’s performance yesterday, should the Spaniard reconsider his decision and offer the midfielder a new deal? Ramsey has not been everyone Arsenal fans’ cup of tea in recent years. He does have the ability to change a game (as evident from yesterday) but at times he seems to try to hard to impress, and that’s what is infuriating about him. However, games like yesterday are possibly the reason why you need him to stay. He has a dedication and desire to play for the club and has done so for nearly 11 years. He has been loyal to Arsenal and visa-versa when he suffered that horrific leg break all them years ago. I believe Emery knows he has a good technical player in Ramsey – the Welshman has proved this on occasions already this season – but we don’t know the ins and outs of their relationship. However, I believe Ramsey may still have a role to play in this Arsenal side, probably even more so as Emery doesn’t seem too keen on Mesut Ozil at present. With that said though, Emery may feel a little embarrassed re-offering the midfielder a new deal after withdrawing one earlier in the season, and with the interest shown in him as a result, Ramsey may decide to continue his career elsewhere.